Kylie Jenner loves being the center of attention — but not in this way! 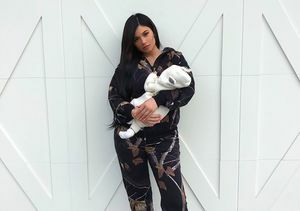 Rumors have swirled that her baby with Travis Scott, Stormi, isn't really Travis' child, but is the result of a fling between Kylie and her former bodyguard, Tim Chung. Now, Chung has posted what he says will be his "first and last" comment on the gossip on Instagram, writing, "Out of deep respect for Kylie, Travis, their daughter together and their families, I would like to set the record straight and say that my interactions with Kylie and her family have been limited in strictly a professional capacity only." Calling the rumors "so ridiculous that they are laughable," he went on to admonish tabloids by asserting, "There is no story here and I ask that the media no longer include me in any narrative that is incredibly disrespectful to their family." Case closed. Y'all have watched "The Bodyguard" too many times.